The lesser scaup measures 15 to 19 inches. The breeding male has a blackish head, black chest, and brownish-black tail and rump. The abdomen is white, the bill pale blue with a black tip, and the eyes are bright yellow. The head is pointed toward the rear of the crown. The female has dark brown upper parts and a gray-brown breast and flanks. The abdomen is white and the pale blue bill has a dark tip. The peaked brown head has a small white patch at the base of the bill in the winter. In flight both sexes show a white wing stripe on the speculum, and dull, dark gray primaries. 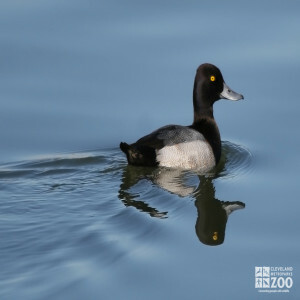 The range of the lesser scaup is from Canada and the United States to Panama and the West Indies. The lesser scaup inhabits freshwater pools and lakes in open country; in winter protected harbors in brackish bays. A gregarious diving duck, the lesser scaup are often encountered in very large flocks outside of breeding season. Pair formation begins toward the end of winter, with breeding taking place in late May to July. They feed chiefly by diving. Migration begins in September and October. Most courting in lesser scaups occurs on the water surface, but it is also marked by frequent diving by the entire courting party as well as by aerial chases. Nesting takes place on the ground among waterside vegetation, often on islands among colonies of terns or gulls. Males leave females at the start of incubation to gather for a post-breeding moult. The fledging period of the young is probably between 45 and 50 days, but females often desert their broods well in advance of fledging, frequently when they are but a few weeks old.